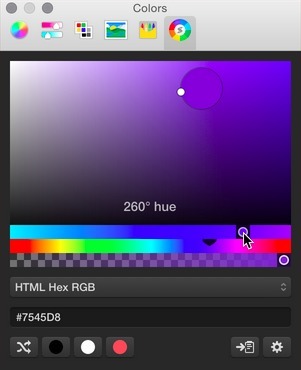 Color picker for designers and developers. Is there a better alternative to Skala Color? Is Skala Color really the best app in Productivity category? Will Skala Color work good on macOS 10.13.4? Skala Color is a compact and feature-rich OS X color picker that works with a huge variety of formats, covering everything you're likely to need for web, iOS, Android, and OS X development -- Hex, CSS RGBA, CSS HSLA, UIColor, NSColor and more. It also automatically recognizes colors copied to the clipboard, presenting them as a swatch that can be applied with a single click. Improved OS X Yosemite support. Improved HEX parsing support (dec0de, #dec0de and ##dec0de are now all accepted). Added the ability to set a pleasing, semi-random colour. Added the ability to copy again, in the last format used. Fixed a rare crashing bug.